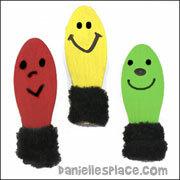 Woodsies Mini Jumbo Craft Sticks - 4.5"
Mini Craft Sticks - 2.5"
3. Cut two mini craft sticks at an angle as shown in the diagram to the right. 5. To make the straw cut a piece of yellow paper to fit inside the manger and hang over the edge when folded, and then cut slits down one length of the paper. Glue the uncut edge inside the manger and fold the cut edge down over the front of the manger. Glue another piece of paper to the back of the manger so Baby Jesus doesn't fall out. 7. Glue a piece of string to the back of the manger. Tie a knot at the top and glue a star to the knot. Wooden Peg People - Use the smallest ones in the package. 1. Before class prepare the mangers. Print out the pattern and cut from cardboard. Glue the ends overlapping each other with a glue gun. Glue two mini craft sticks to each end of the manger as shown. 2. In class have your children draw faces on the the wooden pegs with markers or pens and glue on yarn hair if they would like. 3. Have them wrap the baby up in strips of 1 1/2" wide white material. 4. Let them cut raffia or yarn into small pieces and stick it in the manger (If you don't have raffia, you can use crinkled up yellow paper or tissue paper.) and place Baby Jesus on top. This craft goes along with the Sunday School Lesson "Ordinary Baby" on The Resource Room. New! - Now you can print out the envelope! 1. 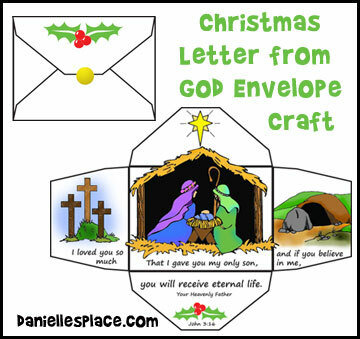 Print out the Baby Jesus in a Manger Envelope Pattern onto brown paper, and cut it out. 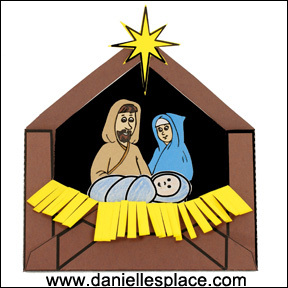 Print out the Star and Hay Pattern onto yellow paper, and the Joseph and Mary and Baby Jesus Pattern onto white paper and cut them out. 2. Turn the envelope pattern over so that the printed side is on the back. Fold the sides up towards you on the dotted lines so that you see the printed sides. Fold the bottom of the pattern up on the dotted lines. Glue the side flaps of the envelope to the bottom flap. 3. Color the Mary and Joseph picture and place it inside the envelope so that the bottom of the picture is all the way to the bottom of the envelope. Glue it to the inside of the envelope. 4. Cut little slits in the hay pattern just up to the thin line on the pattern and then fold the cut fringe down. Slip the hay pattern into the envelope so that the cut fringes hang out. 5. Color the picture of Baby Jesus and place it in the envelope behind the hay. 6. Add a string to the top of the envelope to use it as a Christmas Ornament. Glue the star over top the string end to cover it up. 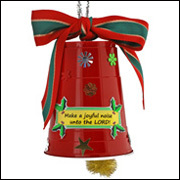 This craft goes along with the Sunday School Lesson "The Best Gift of All" on The Resource Room. In this lesson children learn that the joy we feel when we receive gifts at Christmas is only temporary. There is only one perfect gift that will never disappoint us, the gift of salvation through Jesus Christ. This lesson comes complete with more crafts and activity sheets and games to help reinforce the biblical concepts and the Bible verse. This version of the craft was designed for younger children. 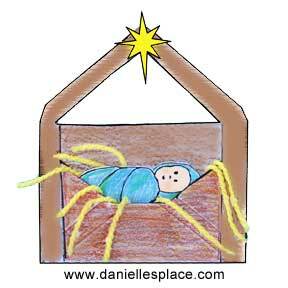 Children can color the picture of Baby Jesus and place him in the manger. Use the directions above, except cut out the middle shape where indicated on the pattern. 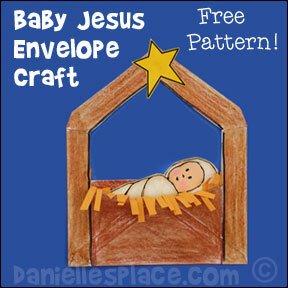 Print out the Bigger Baby Jesus Patterns to use in the manger. Includes colored and black and white patterns of Mary, Joseph and Baby Jesus. To make it more interactive, use pieces of yarn or cut up pieces of felt for the hay. 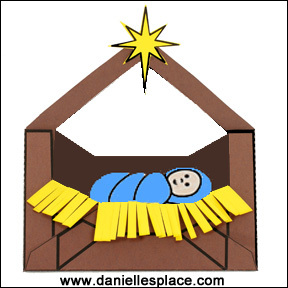 Children will enjoy arranging the "hay" in the manger and then placing Baby Jesus in the "hay". 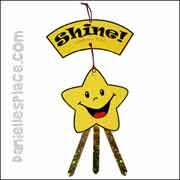 Instead of using the paper star you can use star stickers to save on preparation time. 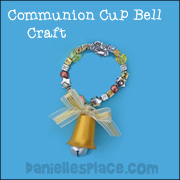 This craft can be hung on a Christmas tree as an ornament. This is a great craft to use when you want to recycle old envelopes. 1. 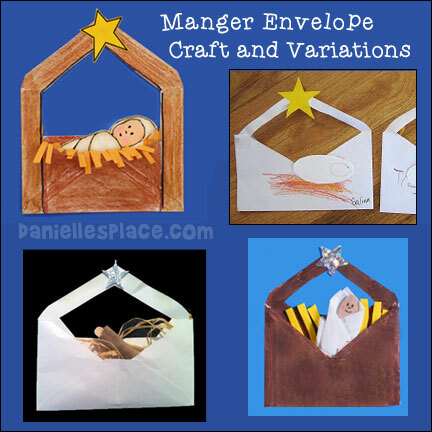 Print out the envelope template and use it to cut the envelopes into a manger and stable scene. 2. Print out the Baby Jesus patterns and cut them out. In class have the children color the mangers and baby Jesus. 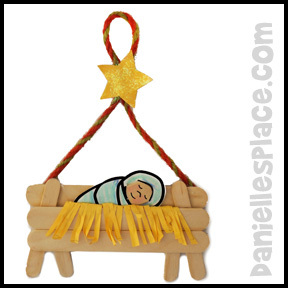 If you don't have a baby Jesus pattern, you can use a craft stick or clothespin. Cut the stick in half and draw a face on one end. Wrap some material around the bottom for the blanket. 3. Place the baby Jesus in the manager and use a glue stick to secure it. 4. Cut up short pieces of yarn. Have the children glue the yarn inside the manager around Jesus. Adventures in Homeschooling used a clothespin for Baby Jesus and real straw to make this version of the craft. 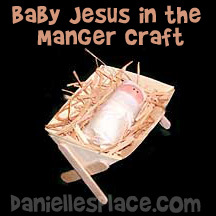 Make Baby Jesus out of a craft spoon (as shown) so children can play act the nativity story! Follow the directions above to make the envelope manger. Cut a blanket shape from felt, material, or tissue. Use long strips of craft foam or felt to make hay. 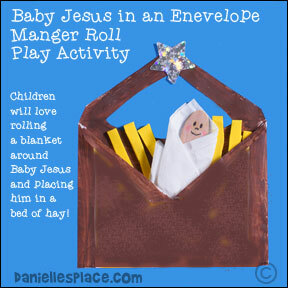 Preschool children will love rolling their Baby Jesus in a blanket and placing him in a soft bed of hay in his envelope manger. This craft goes along with the Sunday school lesson "Ordinary Baby, Extraordinary Gift " and the book by Gloria Gather by the same name. Read the book to your children, or listen to the CD and then have your children draw star shapes on card stock and cut them out. 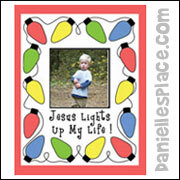 They can draw or glue on pictures of Baby Jesus and then decorate their star ornaments. Hello I just wanted to let you know that we did the lessons on Jesus King Of Kings. Our ages were from 5yrs to 13 yrs. I want to thank you for all the lessons you offer. We look forward to having a new lesson every Wednesday night. The children love the lessons and stay interested and really enjoy doing the crafts. Thank you. Children color the pictures, and then fold up the paper to make an envelope. The outside of the envelope says, "From: Your Heavenly Father"
1. Print out the Inside Card Pattern. Turn over the pattern and place in back in our printer, and print out the Outside Pattern on the other side. *If you can't get the pictures to match up on your printer, just use the inside envelope picture and have your children write the "to" and "from" on the outside and decorate it with Christmas stickers. Beautiful, yet so simple to make! Great for Sunday School! All you need are old CDs, yellow paper, and decorative items. This craft costs only pennies to make! The Bible verse, "For unto you is born this day in the city of David a Savior, which is Christ the Lord." Luke 2:11 is displayed under the nativity scene. 1. 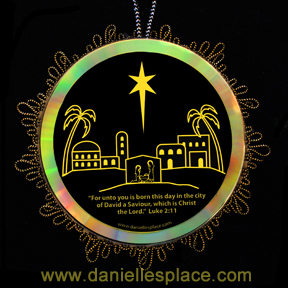 Print out the Little Town of Bethlehem Ornament Pattern onto bright yellow paper. If you are using a printer that has water soluble ink, print out the pattern onto white paper and then use a copy machine to copy it onto bright yellow paper. 2. Cut out around the edge of the picture and glue it to the center of the CD. You can make two CDs with the pictures and glue them back to back so that the ornament can be viewed from both sides. 3. Use sequins, decorative lace, ribbon, stickers, beads, etc. to decorate the ornament. The decorative trim used on this ornament was tape to the back of one CD and then another CD with the same picture was glued to the back to cover up the tape and ribbon. 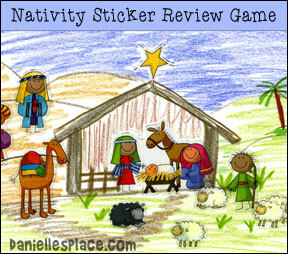 Christmas Stickers are a great way to review the Christmas story. 1. Give each child a sticker sheet, a piece of paper and colored pencils. 2. Tell your children to draw a stable scene. 4. Keep asking questions until every child has used all his or her stickers and completed the nativity scene. You could also use "Make-A-Nativity" Stickers. 1. 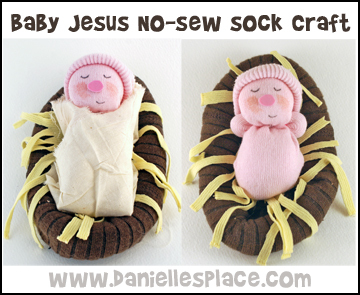 See the No-Sew Sock Doll Directions and the Sock Baby Directions on the Sock Crafts for Kids Page to make Baby Jesus. You don't have to make the feet because he will be wrapped in a blanket. 2. Wrap the sock doll in a piece of muslin. Cut a small circle from craft foam for the nose and draw on the eyes and mouth. Add a little bit of pink fabric paint or watercolor paint for the cheeks. 4. To make the manger roll up a large brown sock. Turn the sock inside out and roll it up so that the right side is showing. Roll it all the way to the toe until you have a donut shape. 5. Use strips of yellow material or natural raffia for the hay. 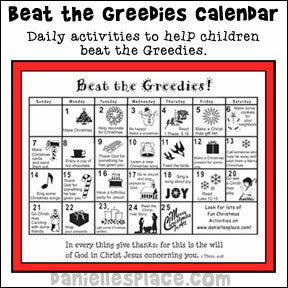 This calendar will help your children "beat the greedies". 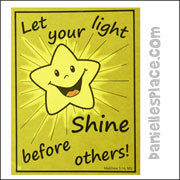 It has an idea of something they can do each day that will help them to focus on others instead of themselves. This Calendar is available to members only on The Resource Room. It goes along with the Sunday school lesson "Greedy Petie". In this lesson children learn about greed and how it affects their lives. They learn that Jesus wants them to be happy and thankful for what they have been given. 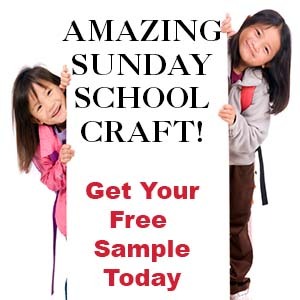 This craft goes along with the Sunday School lesson "The Best Gift of All" on The Resource Room. The picture says, "Baby Jesus so sweet and small, you're the best gift of all!" 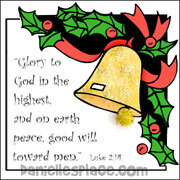 Children color the picture, glue pieces of yellow yarn on the manger, tie a ribbon on the manger and then glue on a bow. Before class the teacher writes words from the Bible verse on the back of the gifts and tapes the picture of Baby Jesus in the manger on the back of one gift. In class children take turning turning over one gift to see if the picture of Baby Jesus is hidden underneath. 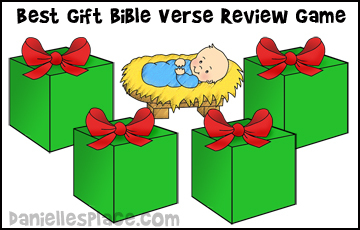 If the gift has a word on it, the child places the word in order to spell out the Bible verse. Pattern available to members only. 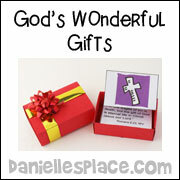 This craft idea comes from the lesson "God's Wonderful Gifts" on The Resource Room. 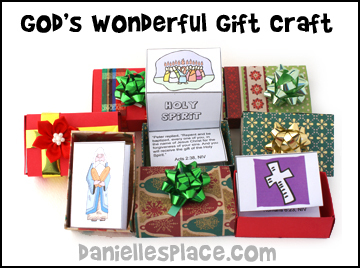 Each box contains a piece of fan-folded paper that has a picture of a gift from God with a Bible verse and discussion question. (Available to members.) Children take turns selecting a box, opening it, and guessing, by looking at the the picture, what the gift might be. The teacher then reads the verse and question. 1. Print out the matchbox pattern onto card stock. 2. Cut out the solid lines. 3. Fold all the dotted lines up. 4. To make the box bottom, glue Flap A over the other Flap A on the same side. Fold down Flap C over the Flap A and Flap B on both sides and glue them down. 5. Fold down Flap E over the F on both sides and glue. 6. To make the sliding top, place glue on the side indicated and stick it over the opposite side. Do you have a Christmas pageant you would like to share? Send it in and we will publish it here for others to enjoy.